eWAVE's multiplexer combines multiple signal into one single fiber. eWAVE offers standard 8-channel CWDM and DWDM mutliplexers. Most models include a bandwidth range of narrowband (1470/1620nm) and wideband (1310/1550 nm) port for overlaying new channels on existing circuits and a faceplate monitor port for testing and installation. As shown in the diagram below, for xWDM applications, signals from SONET/SDH, Ethernet, or other transmission equipment are converted to the required wavelengths through muxponders, transponders or SFP/XFPs used in the transmission equipment before being combined by the multiplexer. 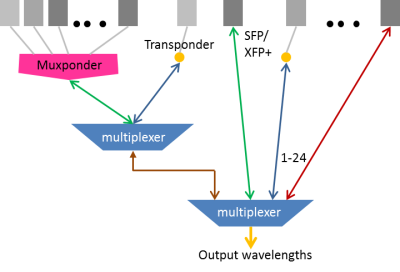 A few of many available multiplexer models are shown below. These Mux/Demux card can be connect with eWAVE4107 and eWAVE4107DiR.